After a day of ceremony and media spotlight a beleaguered, but relieved looking Gilad Shalit returned to the quiet of his family home. Gilad Shalit arrived at his family home in Mitzpe Hila on Tuesday afternoon following 1,941 days as a captive of the Hamas terror organization in Gaza. The IAF helicopter carrying Shalit landed a kilometer from his home after taking off from the Tel Nof Air Force Base in central Israel. From there a convoy of vans escorted by police vehicles with flashing lights drove him from a helicopter landing strip to his home. Along the route were hundreds of supporters waving flags and a large crowd, including reporters, gathered at his home to chant welcomes as he descended the steps to his front door. His father, Noam Shalit, had said previously he would not accept the nightmare was over until Gilad was on their doorstep. “Today we can say that we’ve experienced the rebirth of a child,” Noam Shalit said Tuesday evening, speaking to journalists outside his home. “We hope that you, the media, and this wonderful crowd, will allow us to return to normal life as quickly as possible,” he said. Gilad Shalit did not come out for the press conference. “It is hard for him to be exposed to the public after such a long period of captivity,” his father explained, thanking those who came to show their support. 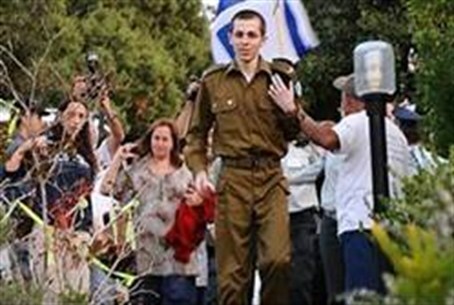 Shalit was first welcomed by a delegation of senior Israeli officials led by Prime Minister Binyamin Netanyahu at Tel Nof Air Force base in Rehovot, who told him, "Welcome to Israel, it's good that you're home." After meeting with his family - his mother, father, grandfather, brother and sister - Shalit underwent further medical examinations at the IAF base before being cleared to fly home. Doctors reported he was in reasonably good condition, but noted his poor pallor, significant weight-loss, and that he was limping. He was termed as having "light injuries." It has been widely speculated that Shalit, in addition to extended periods of isolation, may have been physically abused by his captors.